THE GOAL OF LIFE, according to most Hellenistic philosophies was to achieve Eudaimonia, meaning a good spirit, a flourishing life, or well-being. Zeno, the founder of the Stoa, defined it as a good flow of life, a life lived in according with Nature. They believed that an act is good or bad depending on whether it contributes to or deters us from our proper human end—the telos or final goal at which all human actions aim. That telos is eudaimonia, or happiness, where “happiness” is understood in terms of completion, perfection, or well-being. Pleasure and happiness were not to be pursued directly, they were regarded as by-products of living wisely. Instead our actions should aim for Areté (virtue or moral excellence); the act and habit of living wisely. A good life, then, should be oriented toward worthy ends, having a Telos (end, purpose, direction) and guided by the Logos (reason, meaning, account). Ancient greek philosophy was not only a discourse about abstract concepts and ideas, but a way of life, a means for self-transformation and a moral compass for navigating through life. Since I think that sailing is a suitable metaphor for Stoicism, I have composed the diagram above arranging the most important elements of the system around a compass or wind rose for navigation. The idea is to use the image as a mind map for understanding Stoic philosophy. We do not get to choose most of the things that happen to us in life. We do not choose the circumstances of our birth, our body, family and culture. Most of our decisions are unconscious, and life is full of accidents and unexpected turns of fortune. If we have so little control over our lives, what is then up to us? We can choose the way we face those circumstances. We can use those very misfortunes to train our character, learning from our mistakes and drawbacks, or we can just keep making the same mistakes over and over. Our capability to keep our inner tranquility in difficult circumstances is more valuable than a lost or stolen object, a negative opinion, or even a health problem. When we are in a traffic jam, sick, or in an argument, and start feeling anger and frustration, first we should ask ourselves what can we do to change our circumstances. Maybe we can change that job or take healthier habits. But if change is not possible in that moment, we can try to turn that negative circumstance to our advantage, the way a wrestler uses the body of the opponent for training. The central idea in Stoic philosophy, but also an essential characteristic of ancient Greek culture, was Areté. The English word “Virtue” does not offer an exact equivalent for Areté. A combination of excellence, moral character and integrity, is more truthful to the original meaning of the word. This notion of excellence was ultimately bound up with the notion of the fulfillment of purpose or function: the act of living up to one’s full potential. Areté was the most valuable possession, the guiding-compass to a good life. At heart, Stoicism was a synthesis of Socratic Ethics, Megarian Logic and Heraclian Physics, unified into a system that became the philosophy of the greek and roman elites for almost five centuries. In the first circle of the diagram we find the Three Topoi, or fields of study that sustain the system; Logic, Physics and Ethics. The Stoics compared philosophy with an orchard; Logic was the fence, the trees and ground was Physics and Ethics was the fruit, hence the most important part. Although studied separately, they had to work as a single unit in practice. In the inner ring I have placed the three fields of study, Logic, Physics and Ethics. For example, I have linked Ethics (Ethos; character, custom) with the virtue of Justice, and that with the Discipline of Action, (right actions seeking the common good). Nevertheless all the concepts in this diagram are interrelated and could be interchangeable. The field of Physics we learn about how Nature works, which helps us face reality with courage and acceptance of the Natural order of things. That they called the Discipline of Desire, or desiring that things happen as they must, accepting the laws of Nature with fortitude. For example, we must accept that one day we will die, as it is natural. Desiring to live forever is against Nature, it will just make you suffer unnecessarily, and if you think about it carefully, eternity may not be so desirable, nor even just nor ethical, since other people would not have the chance to live if nobody ever died. So instead of desiring to live forever, or to be young forever, we should accept the rules of life, and focus on what is in our power, to live wisely and achieve Eudaimonía, or a good flow of life. All knowledge enters the mind through the senses, and is constantly being bombarded with impressions (phantasiai). It is up to us to “assent” or not to those impressions, we should not give credit to everything that is perceived or appears in out mind. The aim of Logic is to help us assent to true impressions, dissent from false ones, and suspend judgment when it is not possible to assent nor dissent. Therefore, Logic has to do with our ability to process the impressions, and translate them into sentences that are accurate and connected to reality. We should study Logic in order to develop our ability to use reason and take decisions (Prohairesis). Logic had to help the Prokopton, (the Stoic student making progress) to be well centered and thoughtful, balanced, temperate and poised for intelligent judgments. 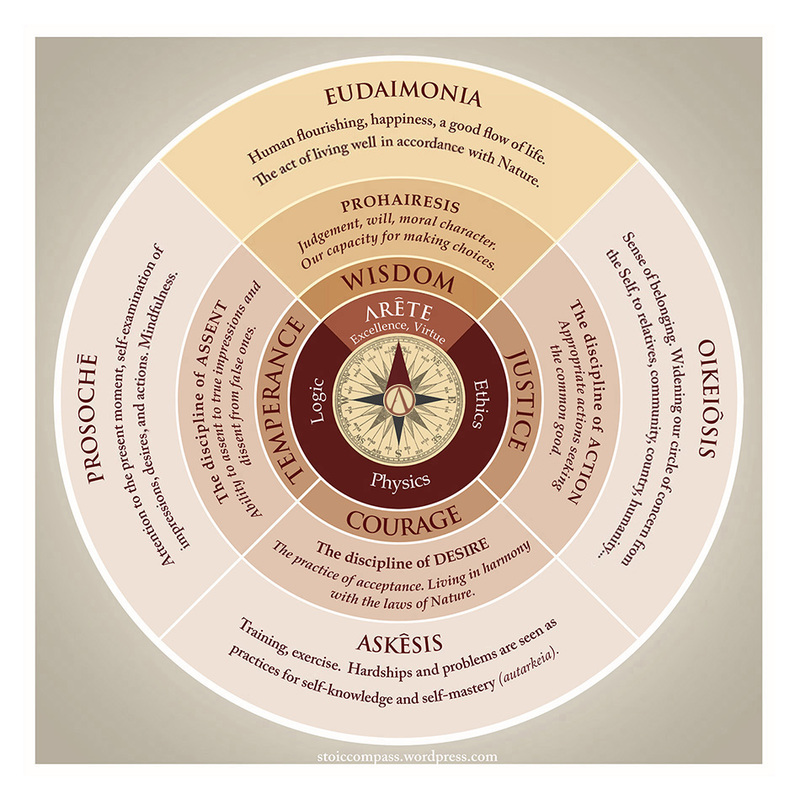 In the chart above, Logic is connected to the virtue of Temperance, and Prosoché or Stoic Mindfulness, but also to Prohairesis, or the ability to take decisions. Physics comes from ancient greek word phusis ‘nature’; which it included Nature, the Cosmos and the forces and principles that govern them. The Stoics defined the goal in life as living in agreement with Nature. But their maxim “live according to Nature” meant living according to the facts, to adjust our inner Logos (reason) to the cosmic Logos. The Stoic system of physics was a dynamic materialism. They followed the pre-Socratic philosopher Heraclitus of Ephesus, who propounded that things are constantly changing (universal flux), that opposites coincide (unity of opposites), and that fire is the basic material of the world. They held that only matter existed, but immanent in the material universe was the Logos, or universal reason, inherent in all things, which acted through matter like and organizing principle. The Logos was described also as a Creative Fire, the origin and the end of the universe, which they believed was a dynamic, cyclical and eternal living entity. “The universe itself is God and the universal outpouring of its soul” Chrysippus. They were what we today call “pantheist”; God, the Cosmos and Nature, were the same thing. The study of Physics included natural philosophy, cosmology, and theology and it was meant to teach the student his place in the Cosmos, understanding the facts of life, such as the changing and impermanent nature of existence. Ethics comes from Ethos “habit”, “custom”,”character”, and it was the final and most important part of Stoic philosophy. The goal of the previous studies of Logic and Physics were to prepare the student for the formation of his character. As a Socratic school of philosophy, the Stoics believed that there is only one good; Virtue, which was based on knowledge, and one evil; Vice, which was based on ignorance. All the rest, wealth, health, reputation, external objects, were regarded as neutral or, as they said “indifferent”, they had no value in themselves. That radical view attracted criticism from the very beginning. How to be indifferent to such things as love, health or family? The Stoics obviously preferred to be healthy and close to their relatives, as it is natural for any human being. But they were aiming at defining what was an “absolute good”, something that would be good regardless the circumstances. Family, love and health are the things that we most cherishes in life, but they are not entirely up to us, and they can also be a source of trouble. A relative could, for example, be a criminal, and we may want to hide him from justice, out of love. We may have influence over our health, but it doesn’t depend on us entirely. Many men and women throughout history have experienced the most important transformations of their lives after suffering a long and difficult illness, many artist and scientist begun to write, paint or study during a crisis of health, exile or prison. Those things are, therefore, not good or bad in themselves, unless used for virtue or vice. Material things per se are indifferent, but the use we make of them is not indifferent. Only Areté, they declared, is a true possession, and would be good to have under any circumstances. Practical WISDOM (Phronêsis) also described as prudence, the ability to judge and discern when and how to act. Wisdom was subdivided into good sense, good calculation, quick-wittedness, cunning, discretion, and resourcefulness. JUSTICE (Dikaiosyne) Wisdom in the face of injustice. The habit of rendering the other’s rights. Justice is subdivided into piety, honesty, equity, and fair dealing. COURAGE (Andreia) Also called Fortitude, Wisdom in the face of danger or pain, fear or moderation of rash behavior in the face of danger, pain or difficulty. Courage was subdivided into endurance, confidence, high-mindedness, cheerfulness, and industriousness. TEMPERANCE (Sophrosyne) Wisdom in the face of excess, also moderation. Sophrosyne comes from the adjective saos “safe” and phron “mind”. It describes a mind which is well centered and thoughtful, balanced and poised for intelligent judgments. Temperance was subdivided into good discipline, seemliness, modesty, and self-control. If we analyze the common errors we make, we will probably be able to place them in one of the four categories. They arise from flaws of character that we can place in lacking Temperance, lack of Courage, Justice or Practical Wisdom. We cannot have Areté if we don’t have the other four virtues. For example someone may have courage, but at the same be cruel and unjust, so by lacking Justice and Temperance, his bravery will not count as a virtue, but as a tool for enhancing his cruelty. That is why we don’t admire war criminals, even if they may show bravery in some actions. As beginners, we must train our virtues with the simple challenges of daily life. During a long traffic jam we can train our Temperance. Under a painful illness we can train both our Temperance and Courage. In an argument with a spouse, we may need all the virtues, but we can focus on training our sense of Justice and practical Wisdom. The Discipline of Assent, making a proper use of impressions and judgements. The Discipline of Desire, harmonizing our will and desires with the course of Nature. The Discipline of Action, the right actions seeking the common good. The discipline of ASSENT (Sunkatathesis). The ability to assent to true impressions, dissent from false ones, and suspend judgment (epoché) toward uncertain ones. Concerned with how we should judge our impressions so as not to be carried away by them into anxiety or disturbing emotions. Epictetus calls eph’ hêmin, up to us, what is in our power, the correct use of impressions. The discipline of Assent was the base of Prohairesis or willpower, reasoned choice, giving or withholding assent to impressions. The practice of attention, also mindfulness. Observing our sensations, emotions and thoughts, focusing one’s awareness on the present moment, learning to maintain tranquility (Ataraxia) and peace of mind in any given situation. It is the fundamental Stoic spiritual attitude. This presence of mind and vigilance is a very important part of the Stoic practice. If we are able to observe our anger growing inside us, we are one step closer to be able to put it in its right place, that in many cases is a misunderstanding of the real situation, or in any case, an impediment for taking a right decision and action. The first discipline concerns with desires and aversions. Most of human suffering and anxiety have to do with desiring things that lay outside our control, like wanting to change the past, or that are unnatural, like wanting to be young forever. The Discipline of Desire is the exercise of living in harmony with the laws of Nature. Practicing resilience and acceptance as exercises, or Askesis, and making use of the virtue of Courage when the situation requires it. This entails having a “philosophical attitude” toward our destiny. But how can this help us live better? For example, if you fall ill, or suffer an accident, you are in the domain of Physics. To overcome the ordeal you need Courage and Temperance. You can moan and cry or you can take it as a training or exercise (Askesis). Going through it with the proper attitude improves your character. According to the Stoics, spending some time ill in bed or breaking a bone, has much less value than the opportunity of building a strong character and practicing one of the Cardinal Virtues. A wise person would seek to harmonize his inner Logos, with the greater cosmic Logos, just like a musician attune her instrument to the symphony orchestra. Hence, a Sage would consider the facts of life, such as aging and dying, without affliction nor attachment, just as naturally as one who goes to sleep after a hard day of work. When I see a man anxious, I say, What does this man want? If he did not want some thing which is not in his power, how could he be anxious?’ (Discourses 2.13.1, trans. Long). Exercise, preparation for a test, disciplined training, designed to achieve virtue. A term coming from athletics, the Stoics used it in a philosophical context. A preparation for the hardships of life, a stoic student (prokopton) would practice voluntary discomfort and abstinence as training. It was common that young students would sleep on the ground, walk barefoot, eat frugally or fast, in order to train mind and body. Nevertheless, everyday life’s difficulties and hardships are also subjects of practice. Epictetus said difficult problems in life should not be avoided, but rather embraced. Every obstacle can be transformed into a good subject of training. It is the practice concerned with our ‘impulses to act and not to act’, that is, our motivations, and goals. The Appropriate Actions (Kathēkonta) and duties. The discipline has to develop the skill to do the right action (Kathekon), at the right time (Kairós), for the right reason (Orthos logos). Hormé was the Greek goddess personifying energetic activity, impulse or effort (to do a thing), eagerness, setting oneself in motion, and starting an action. But the outcome of our actions is not wholly in our power, only our inclination is in our power. The Stoics use the analogy of sailor setting out a journey. The sailor wants to arrive to his homeland, that is his aim, but he has no control over the elements, the winds and the sea are not in his power, only his attitude and his skills to adjust the sails adapting to the changing conditions, keeping his course, remaining calm when a storm hits. It is the inner battle what is to be won, since the external battle is not up to us. Appropriation, familiarization, affinity, affiliation, sense of belonging. The opposite of oikeiôsis is allotriôsis, which translates as “alienation.” Stoics saw humanity as a single community, in which all humans were relatives, and citizens of the cosmos (Cosmopolis). To understand that doctrine, we have to picture a series of concentric circles, beginning with our Self, then our family, friends, community, country and eventually the entire human race. Then we should contract the circles, to reduce the distance between them as much as possible, so caring for our relatives as for ourselves, our friends as our relatives, our community as our friends, and so on, till we see all mankind as our countrymen. Stoics saw the world as a single community, in which all humans are relatives, and are here to work together (sunergia). We find more meaning in our lives when we overcome our small self, and let our actions be guided towards something higher, like the common good. The journey of human existence should be like that of an initiation. From the ignorance and alienation of infancy and adolescence, to the ethical self- transformation, wisdom and human flourishing of maturity. Our faculty for judgment, volition, and choice, our ability for giving or withholding assent to impressions. Essential for the formation if a ‘moral character’; the capacity that rational beings have for making choices and intending the outcomes of their actions. Epictetus used the term hêgemonikon ‘commanding faculty’ of the soul (psuchê) which in greek meant our very being, the centre of consciousness.